When your muscles and joints are hurting, do you reach for analgesics? Although medications may resolve your discomfort, they tend to render side effects. The Ohio State University Medical Center recommends massage for drug-free relief. 1/ A percussion massager is a handy, portable solution. Here’s a selection of the best devices that put healing in your hands. Percussive Massage – What is it? Conditions Treated – What are the benefits? Percussion is very effective in revitalizing sore muscles. It’s also used to clear the lungs of mucus. The deep strokes of tapotement are most suited to fleshy areas of your body rather than joints. Percussion gently stretches your muscles and breaks up adhesive scar tissue. A percussion massager is a motorized tool that generates vibrations. The device has three basic external parts, a head, nodes, and handle. The nodes extend from the weighted head, sending vibrations deeply into your muscles. The weight of the unit and nodal pressure create a deep form of massage. By manipulating the settings, you can customize the therapeutic effects. Effectiveness – A home device delivers similar benefits to a massage therapist, detailed below. Convenience – With a portable massager, you can obtain massage at any time. There’s no need to travel to a facility or host a therapist in your home. In addition, several household members can benefit from using the device. 2. Joint Flexibility – When muscles are more elastic, you have greater joint flexibility and easier movement. 5. Exercise Recovery – A Buck Institute study found that massage reduces muscle inflammation after workouts. 7/ Tissue manipulation activates genes that decrease swelling. Just 10 minutes of massage speeds recovery so you can return to the gym in short order. Weight – A heavy massager is hard to hold for prolonged periods. Since fatiguing your muscles is counterproductive, a light massager is a better choice. Shape – The unit should feel balanced, enabling you to reach behind your shoulders. Speed – With various speeds, you can customize massage intensity. Heat – When muscles are warmed, they loosen up faster, making heat a desirable feature. Durability – A warranty is your clue to projected longevity. Company Profile – The TheraRUB Massager is manufactured by Clinical Health Services, Inc. In business for 20 years, the company distributes a full line of rehab, chiropractic, and massage supplies. The firm is based in Tampa, Florida. This is a full-sized, professional grade device, with dual heads and three interchangeable node caps. Dual heads cover a larger surface area than a single head. The node caps and variable speeds enable you to customize massage depth and intensity. Your muscles will enjoy the comfortable vibration. The rubberized grip won’t slip from your hands, and cord length is a generous 14 feet! At 3.6 lbs, you’ll find the device easy to lift. Therapeutic heat is not a feature. The device is reputed to be very durable and is backed by a 1-year warranty. For a video clip of the TheraRUB, click here. 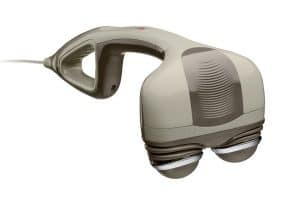 Company Profile – Operating for nearly 30 years, HoMedics is a leading manufacturer of body massagers. The company markets the most extensive range of personal healthcare products in the US. HoMedics also distributes globally to over 60 countries. The firm is headquartered in Commerce Township, Michigan. You’ll appreciate the streamlined handle of this device, making it lightweight and easy to grasp. The dual heads vibrate and pivot, with a comfortable, piston-like action. 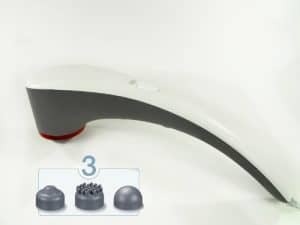 Three node caps give you the options of gentle, firm, or heated massage. Speed is adjustable, and cord length is ample at 4 feet. After 15 minutes of use, the device shuts off automatically, a nice safety feature. At high-speed, this machine means business, generating 3,100 beats per minute. Receive heat with the touch of a button to easily relax tense muscles. The unit’s design enables access to areas normally hard to reach. Your thighs, shoulders, calves, and back will thank you! The unit comes with a 2-year warranty, testifying to its durability. For a video introduction to the HoMedics, click here. Company Profile – In business for nearly 100 years, Wahl is well-established as a supplier of home grooming products and massagers. With distribution to 165 countries, Wahl is synonymous with integrity. The family-run business is headquartered in Sterling, Illinois. You’ll find this device easy to hold, with finger depressions on its slender handle. The unit is lightweight at merely 3 pounds. The 8-foot cord and long wand facilitate reaching your back and shoulders. Four attachments provide customized massage. The “Four Finger Flex” simulates human touch. “Acupoint” targets muscle knots. The “Deep Muscle” attachment renders gentle strokes with its smooth head. The “Raised Bump” attachment treats large areas with its wide surface. Varying the speeds is seamless with a scroll button on the wand. The motor is a workhorse, generating 3,350 pulses per minute. The unit does not feature heat or automatic shut-off. 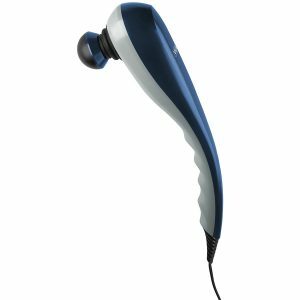 The Wahl massager is backed by a 2-year warranty. To see the Wahl at work, click here. Company Profile – Although relatively new to the market, Zyllion’s 5-year history is upstanding. Products are highly-rated and supported by reliable customer service. The company is based in Lake Forest, California. Weighing a mere 2 pounds, the Zyllion is a featherweight. The sleek handle makes it easy to maneuver, following your body contours. Infrared heat is another key feature, with peak temperature reached after six minutes of turning on the device. Three interchangeable nodes vary the massage method. Just slide the thumb dial to tailor depth to your preference. The generous, 6-foot cord has a wide radius. For a video introduction to the Zyllion, click here. Use your device for 15-minute sessions, up to three times per day. Avoid keeping the massage head in one area for more than three minutes. Prolonged application can traumatize tissues. Note the safety guidelines for your unit. 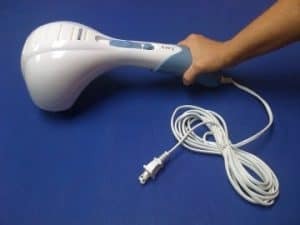 Clean your massager with a dry cloth. Avoid contact with water, which can cause irreparable damage. Before using a self-massager, consult your physician if you have diabetes, phlebitis, thrombosis, or take blood thinners. Home units are contraindicated with implanted hardware such as pacemakers, rods, pins, and screws. Pregnant women should also obtain physician approval before use. Your healing is at hand!